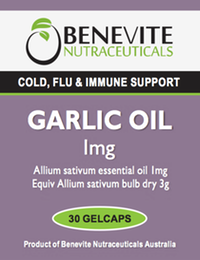 Benevite Nutraceuticals™ Garlic Oil has traditional uses for the relief of colds, flu’s and catarrh and is used to support and maintain the health and function of the immune system. 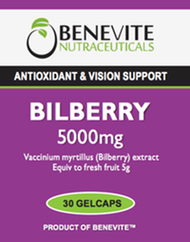 It has potent antioxidant activity. Garlic Oil supports the cardiovascular system and may help maintain cholesterol within the normal range in healthy people and improve HDL/LDL ratio. Take 1 capsule 2 times daily, or as directed by your healthcare professional. * Garlic has potent antioxidant activity. * Supports healthy immune function. * Helps to maintain a healthy immune system. * Garlic has traditionally been used for the relief of colds, flu's and catarrh. * May help maintain normal [and/or healthy] cholesterol levels in normal [and/or healthy] individuals. * May help maintain cholesterol within the normal [and/or healthy] range and improve the HDL/LDL ratio in normal [and/or healthy] individuals. * Supports/maintains the health of the cardiovascular system. * Supports/maintains the health of the blood vessels.